A typical adult mouth has 32 teeth, and each part of this tooth has their own functions and properties. But did you know what are these parts that make your teeth so strong? The tooth anatomy is simple. The tooth is composed of different layers that function together so you can chew the food properly and give you a beautiful, healthy smile. Understanding the role of each of its parts including the guidelines of a proper tooth and gum care will help you gain an admirable oral health education and uphold a sturdy teeth that should last for a lifetime. A tooth is made up of two parts, which are the crown and the root. The crown is visible and you can see it every time you open your mouth. 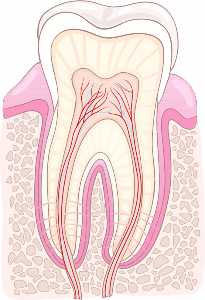 The root is the one you can’t see as it extends underneath the gum line and makes up around two-thirds of a tooth’s entire length. Each tooth has four different tissues with different functions to perform. Enamel: It is the protective layer of the tooth, made up of phosphorous and calcium. It’s harder than bone and protects your tooth from decay. The dental enamel is translucent due to its mineral composition. Dentine: It’s located under the surface of tooth enamel and below the cementum. Dentine is a bone-like material containing microscopic tubules. Compared to enamel, a dentin that’s exposed is highly at risk for bacteria that trigger cavities and sensitivity. Cementum: It’s a coating that covers the roots of the tooth and is like a softer version of enamel. It helps with the stability of the root by attaching the roots to the fibres that anchor the tooth into the jawbone. Pulp: It is found at the center of the tooth. The pulp contains blood and lymph vessels, nerves and other soft tissues that transport signals and nutrients to your teeth. There are different types of teeth, and each has kind of different shape and plays a distinctive job. Incisors are the eight teeth in the very front and known as the sharpest teeth that are used to bite foods and shaped to shovel them inward. Canine teeth are pointed teeth outside the incisors and are built for tearing food apart. Because of their function, canines have very long roots. Premolars are found just behind the canine teeth and used for chewing and grinding food. They have more flat chewing surface since they’re intended for crushing food. Molars are flat teeth in the rear of the mouth and best used for chewing and grinding food. Wisdom teeth (third molars) are the last teeth to develop and do not normally break through the gum line until the person turns 18 to 20 while others never develop wisdom teeth at all. To know more about interesting facts about your teeth, visit your trusted dental partners here at Bondi Dental. We are a reputable, well-regarded dental practice offering topnotch dental services for over 30 years. At Bondi Dental, we only use the latest technology and are equipped with state-of-the-art equipment to provide you and your family with high-quality dental services, so you can keep a healthy mouth with a healthy teeth that are well taken care of.